Very few authors can create an original concept for the fantasy genre, for almost all avenues had been exploited. Of course, it only takes tying up different concepts together to create a great working story, but this tends to be very hard to do because you have to make sure to balance every element you've put and remember all of them. 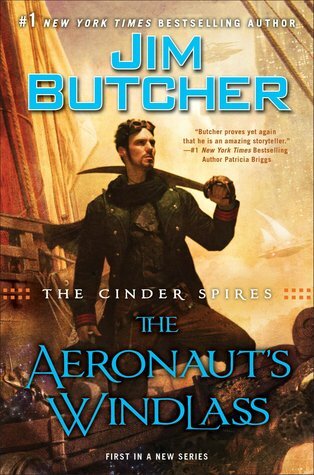 Jim Butcher’s Aeronaut's Windlass is a combination of steam-punk tech setting set on an almost apocalyptic end, where humans live on Spires way above ground. The surface is said to be riddled with monstrous creatures since the beginning so only the unlucky and the stupidly reckless go there. I love the Aeronaut's Windlass pirate-y feeling—with captains and airships set in a steam-punk setting. The world is designed like those old pirate stories set in old England but with sailing through the skies instead of the sea. Intriguing is the best word to describe this start of a new series. A captain with dark history, a noblewoman set on making her mark on the world on her own, a caste of warriors with unbelievable physical prowess and crazy old men with strange powers. All these elements promise one strong series that a fantasy fan like me will enjoy. The part I enjoyed the most was how Jim Butcher gave cats a completely different role, not as pets but an equal to humans, with their own language and tradition. Though I am not a cat person, the way Jim Butcher tried to show us a bit of insight on how cats think is very accurate. I also feel that in the coming parts, the cats’ and humans’ tolerance for each other will be tested at some point as we go along. The technological aspect of the story confused me a bit. My mind is not wired for that stuff so I tend to gloss over them. Though, I'm fascinated by it, it's sometimes hard for me to keep track when they started talking about trim crystals, webs and the like. I expect more on adventures aboard the Predator going to distant places and sky battles plus more privateering on Grimms ship and crew. This was one heck of ride to read.